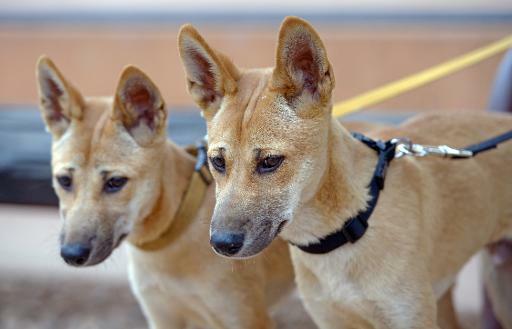 Alice Springs (Australia) (AFP) – Marle and Digger may be small and cute puppies, but make no mistake, warns their handler Matt Williams: these 18-week-old dingoes are wild animals that would never make suitable pets. The brother and sister pair who live at the Alice Springs Desert Park in central Australia are genetically pure dingoes, meaning they are two of the increasingly rare specimens of the aggressive sub-species of the Grey Wolf. “They are very, very different to a domestic dog,” Williams says as he attempts to keep the agile animals under control. While many are tempted to pat animals that appear canine, instinctively scratching their heads or ears without expecting an adverse reaction, things work differently with dingoes, which are found mainly in Australia. “Even though they might look like a dog and have four legs and wag their tail, they are a wild animal and you have to respect and treat them as such,” says Amanda McDowell, president of the Australian Dingo Conservation Association. Yet despite its ferocity the dingo — shown by fossil evidence to have been in Australia for at least 3,500 years — may be in a fight for its own survival, with some fearing that interbreeding with wild domestic canines could see it become extinct. McDowell believes that the animal’s demise cannot be stopped, only delayed. “It is truly on the brink of extinction. A lot of people have the perception that there are plenty of dingoes still out there,” she told AFP. She says the animal’s plight is “exactly like the thylacine” — the mysterious striped canine beast known as the Tasmanian tiger, the last example of which is believed to have died in Hobart Zoo in 1936. “The broader community still believe there’s plenty out there and there’s not,” she said. Short of genetic testing across a large number of animals, it is hard to pinpoint exactly how many dingoes remain in the wild. Conservation biologist Mike Letnic from the University of New South Wales says the number is debatable, but there is clear evidence that much interbreeding had occurred near the major cities since domestic dogs arrived with the first Europeans in 1788. “On the east coast there is evidence of a lot of hybridisation with dogs, and in those areas dingoes are endangered,” he said. Letnic added that dingoes are “basically extinct” from areas where sheep are raised and wheat is grown. “And whatever dingoes are there are heavily persecuted (by people),” he said, referring to how the animal is considered to be a pest by livestock farmers. He added that dingo populations were healthy in other places such as the central desert. The predatory nature of the animals was given international exposure with the sensational case of Azaria Chamberlain — a nine-week-old baby snatched by a dingo during a camping trip at Uluru in central Australia in 1980. The public found it hard to accept that a wild dog could carry off a baby and a jury convicted Azaria’s mother Lindy Chamberlain of murder. She spent around three years in jail before the chance discovery of a piece of Azaria’s clothing near a dingo lair led to a fresh inquiry which eventually saw her pardoned. The final ruling in the case in 2012 found that a wild dog took the infant, finding clear evidence that a dingo was capable of “attacking, taking and causing the death of young children”. In recent years reports of attacks by dingoes or cross-breeds have included cases of both children and adults being attacked — including a nine-year-old boy who died on Queensland’s Fraser Island in 2001. “You can’t treat them like a dog,” says McDowell. McDowell runs a captive breeding programme in a rugged mountain area west of Sydney, carefully selecting among her 32 animals for breeding in a dedicated attempt to conserve the unique animal’s gene pool for zoos and fauna parks. Digger and Marle are two products of this work, after their parents were found orphaned in Queensland’s remote Cape York region. For McDowell, keeping the dingoes’ genetic integrity ensures one of Australia’s top order predators maintains its place in the ecosystem keeping feral dogs, cats and foxes at bay.